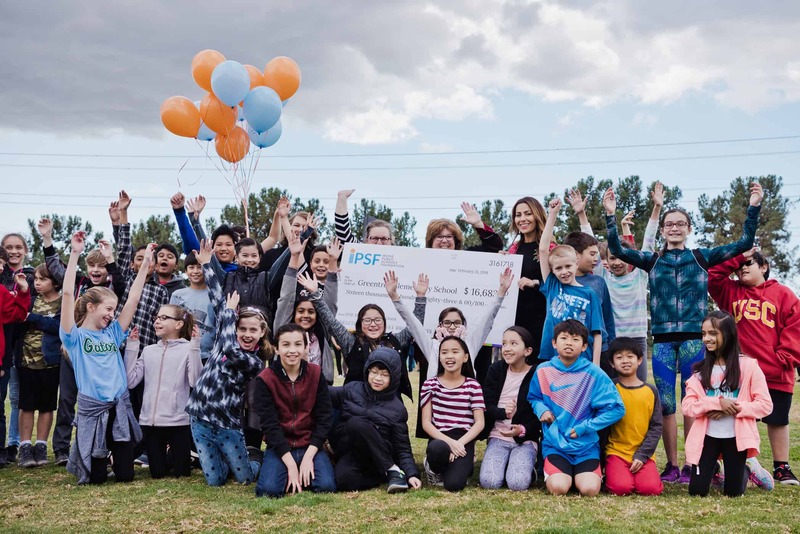 Each year, Irvine Public Schools Foundation (IPSF) offers teachers and staff in the Irvine Unified School District (IUSD) the opportunity to apply for funds through the Innovative Grants Program to implement new and creative approaches to teaching and counseling. The purpose of this grant program is to support innovation in schools by awarding funds to implement new curriculum and improve the educational experiences of students. The program in total will award 19 projects and over $160,000 in grant monies this year to support innovative teaching methods in schools. This year, IPSF awarded eight (8) mega grants, up to $20,000 each, to provide educators an opportunity to create an even greater impact on their schools and classrooms through innovation. IPSF made surprise visits to mega grant recipients’ schools, presenting big checks during assemblies, fire drills and in the classrooms. Projects awarded included Innovation Labs, a district-wide mental health program, a forensic science program for high school students, and a career certification program. All recipients were recognized at a reception on Monday, February 26 at TAPS Fish House & Brewery in Irvine. Since 1996, IPSF has awarded over $1.5 million to teachers and counselors, benefiting over 150,000 students since the program’s inception. Helps develop skills in leadership and servanthood by connecting students to service-learning opportunities, at their school and in the community. Provides technological tools through the school’s Media Center to create opportunities for students to innovate, collaborate, and connect learning experiences to class curriculum. Enhances student engagement by using immersive learning games to develop teamwork and critical thinking skills through solving a series of challenging puzzles. Addresses cyber citizenship, digital literacy, and STEAM learning by teaching students how to safely thrive while doing educational projects in an online environment. Provides students a makerspace to apply their critical thinking skills through tinkering, playing, experimenting, expressing, and collaborating to solve STEAM challenges. Enhances existing innovation lab by providing relevant technology and hands-on engineering materials to deepen student thinking and problem-solving skills. Innovate and Create with mBot! Incorporates tools in the elementary classroom, such as Robots Kits and mBot, to provide engineering-based STEM experiences that will inspire young engineers. Aims to provide engaging, project-based learning experiences for students through the addition of a STEAM Lab. Program designed to cultivate and maintain a school culture where all students and families feel welcome and connected to the school and the community. Initiative that recognizes students who have demonstrated kindness towards others. Provides students the skills and practice necessary to appropriately access technology tools, navigate virtual learning environments, and work collaboratively with other students through the use of Chromebooks. This grant is funded by IPSF in partnership with GoogleFiber. Provides students the opportunity to explore the relationship between humans, the environment, and our responsibility to find sustainable solutions to global issues. A hands-on, transdisciplinary program consisting of three courses (Forensic Science, Forensic Psychology and Critical Theory & Literature) for high school students. Program to develop college and career readiness skills for high school students through industry certification exams and internship and apprenticeship opportunities. Extends Second Step, an evidence-based, social-emotional learning curriculum, to pre-school, middle, and high school students. Program designed to help special education students learn how to utilize meditation, yoga, and sensory tools to regulate their own emotions. Provides 5th and 6th grade students the opportunity to study under a world-class clarinet clinician to inspire and motivate them in their music endeavors. Helps students with intellectual and developmental disabilities develop skills needed to find and maintain employment through the use of Chromebooks.